Now that heavy winter coat season is over, it’s time to pay attention to what’s underneath, namely your spring wardrobe. Those who know me, realize that I recommend building your wardrobe gradually, season by season, not all at once. This will ensure you have a mixture of current and classic pieces, and can experiment with various styles without having a large budget outlay. As you’re beginning to shop for spring, here are my suggestions for five items for men and women that everyone can use. 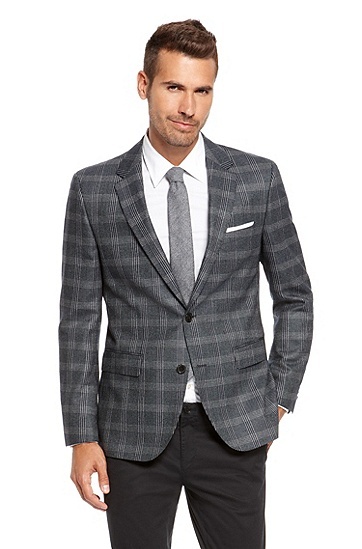 Plaid sport jacket. A sport jacket will take you many places, and is a versatile addition to anyone’s wardrobe. A plaid pattern will look current and fresh. Wear it to work with a shirt and tie, at a networking event or business dinner without the tie, and on the weekend with a more casual shirt, and jeans. Pocketsquare. I have been selling a lot of pocketsquares recently, as they look bright and colorful peeking from a suit pocket. They can be worn with a complementary tie, a bowtie, or on their own. Don’t try to match the tie exactly. A shorter all-weather coat. A water resistant three-quarter length coat in a neutral such as black, tan or gray will work with both a business casual outfit, or a suit, and is convenient to wear during changeable spring weather. Nicely fitting jeans. There are so many jeans out there that it shouldn’t be too difficult to find a pair in a good quality dark wash, that fit well. Try Hiltl or AG (Adriano Goldschmeid) if you are having trouble. Updated Eyeglasses. Glasses have become a tremendous fashion statement. Find a pair that complements the shape of your face and picks up either your eye or hair color. Navy Jacket or Blazer. This would normally be on the men’s list, but navy is so big this season that I am recommending it as a starting point for women. Ladies, your navy jacket can be worn with khaki, gray, or white pants, along with jeans, skirts and dresses. Longer Skirt. A longer skirt or dress will be a welcome change from pencil skirts, and can be finished off with a jewel neck top and jacket, or a mid-length belted cardigan. White or Pastel, Top or Jacket. An easy way to update your spring wardrobe is by adding a pastel top, or white or light colored jacket. Choose lavender, pale blue or light pink, and wear with black, brown or navy for a warm-weather look that still has an edge. Comfortable shoes. New lower-heeled shoes can be medium height or flat. Try them in a fresh color, or with interesting details like a laser-cut edge, applique or bow. For office shoes try a two-toned look, and for casual I love the new brightly colored Prada loafers. Knit scarf or shawl. Knit scarves in cotton or linen can add a playful edge to a casual outfit. A knit shawl will finish off a sheath dress or short-sleeved top and skirt. Choose a complementary color with edge details or fringe. You can see there is some overlap with the men’s and women’s wardrobe lists. Guys can certainly choose a navy blazer, colorful loafers, or knit scarf, and ladies, it’s always a good idea to consider #5 for men, and update your eyeglasses.